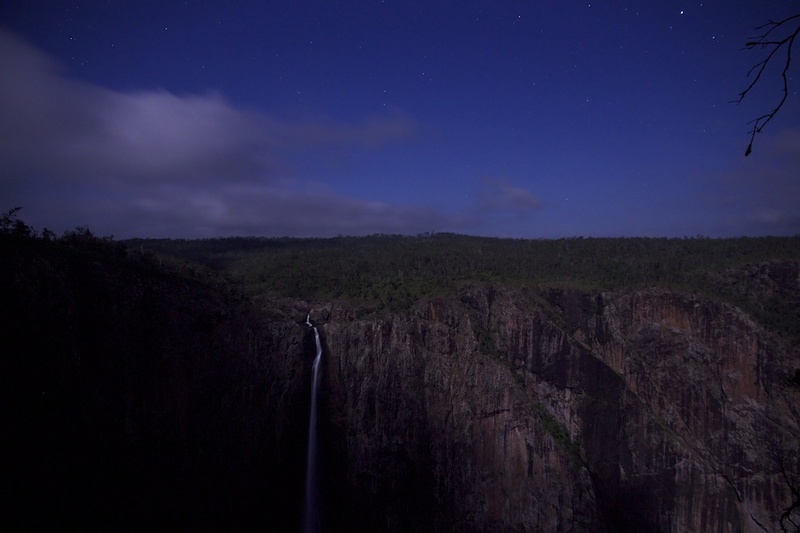 The moon was nearly full when I camped at Wallaman Falls (previous post) and plenty bright enough for a moonlight ramble so I wondered if it might be bright enough for a moody photo of the falls. I knew it would be a technical challenge for a photographer with an entry-level DSLR and no tripod or remote shutter release, but I don’t mind a challenge and it was a good-enough excuse (if I needed one) for visiting the falls at night. The shot above, straight from the camera except for a size reduction for online use (click on it for a larger version), was one of the better results. For the technically inclined, it was taken on a Canon EOS 600D, with a Canon 15-85mm zoom lens wide open at 15mm and f3.5, ISO 800 (higher ISO’s with this camera lead to unbearably noisy images) and an exposure time of 13 seconds. And no, it wasn’t really hand-held – I rested the camera on the lookout railing and held it very firmly as I pressed the button. Friends and family have alerted recently me to two photography competitions which they thought I might like to enter. 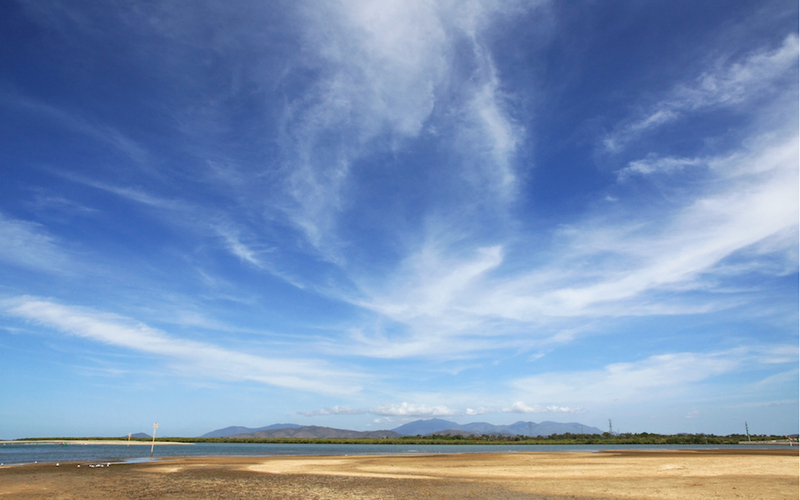 They were right, and the photo above is one of two that I’ve submitted to The Wild Beauty of Weather, the competition sponsored by ABC Science (the other is from the series of misty Magnetic Island views I took during the Wildlife Queensland walk around Many Peaks in May). The other competition is more local: the Museum of Tropical Queensland’s Backyard Safari Photography Competition. It opened in June and doesn’t close until the end of October so there’s still plenty of time for everyone to enter. Entry is free (at is it for the ABC competition) and you don’t even have to win a prize to get a little kudos, since entries nominated by the judges will be exhibited during December 2014 and January 2015. And I do encourage everyone to enter (although by doing so I must be reducing my chances of winning) because looking critically at our photographs to choose the best of them is valuable in developing our photographic skills. It can also be an excuse for an enjoyable ramble through the archives; most of the shots on my shortlist for the Backyard Safari have already appeared, as you might expect, on this blog, e.g. Percival, or on my Flickr photostream and looking through them has brought back many pleasant memories. Oh, and the competition can be an excuse for a day-trip somewhere special to get that photo we’ve always dreamed of … too bad about weeding the lawn. My spies alert me to some fascinating science and tech stuff on the web (thanks, guys!) and it’s time to share again. If you put lots of metronomes on a table and start them at different times, they look for all the world as though they notice each other and gradually agree to line up so that their ticking is synchronised. See a very cute video of it here and read about why it happens. I make synchrony the centerpiece of my book on music, Beethoven’s Anvil: Music in Mind and Culture, where I discuss Strogatz on fireflies and Barbasi on synchronized clapping. I argue that, when people make music together they individually give up so many degrees of freedom that the overall neural-state space for the group is no larger than that for any one independent individual. And that’s a good thing, otherwise no one in the audience would be able to make sense of the performance as no one has more than their own brain available to make sense of the sound. If the metronomes made you smile, this one will make your jaw hit the ground. The TED talk speaker leads a group which takes high-speed video to levels I had never even contemplated: they have made a movie of a beam of light progressing through a Coke bottle. I have seen it and I still think it sounds flat-out impossible but I have to accept that they have done it. Previous posts: Lightning, mathematical butterflies and Kottke’s blog; interactive periodic table; the scale of the universe; or just browse the ‘technology’ category via the sidebar menu.